Read More US rock band Needtobreathe have released their fourth album 'The Reckoning'. The fourteen-track album is the follow up to their 2009 album 'The Outsiders' and features their latest single 'Drive All Night'. Rock music can mean so many different sounds, and this rock sound is very different to a lot of Christian rock music out at the moment, with elements of indie to it. Only once in a while does an album stop me in my tracks and on first listen to this album it was an instance stop what I was doing. I loved it from the word go and now can't stop playing it. "Instead of recording 30 songs and cutting them down like we have in the past, we decided to focus in on 15 tracks for this album and record those until we had the best versions possible" explains frontman Bear Rinehart. "That might mean having to re-track the same songs five times in five different ways, but I think it's really worked because some of these songs didn't take their real shape until later in the process. I think the record is definitely darker, but I think there's more rock on this album then there ever has been in the past". The darkness Bear talks about appears on the album from the word go. Opening track Oohs and Ahhs start with a haunting melodic tune, the music slowly creeping under your skin. But what takes away from it being a scary haunting sound is the great harmonies in the chorus. When you think this dark slow song is all you are getting, it then explodes into your ears as the guitars are let out and this slow paced haunting tracks turns into an out and out indie rock track. If that wasn't enough for one song, when you expect the song to finish, the fade out moves into a very quiet well played piano and trumpet with the melody line sounding as beautiful as a setting sun. But before you get too comfortable in that, the overlaid driving guitars build and build until the guitars burst back into life taking over the song and ending it as a massive rock anthem. Wow. The musicianship on this album is as good as anything I have heard from any album in the last few years, creative indie rock at it's best. The bass work all over the album has to be complimented. Second track White Fences sounds a lot like the sound that Mumford and Sons and Noah and the Whale are creating at the moment, with its sort of folk sound with great melodies and harmonies. The same can be said for songs like Drive All Night, with its bass led intro, and Slumber. Vocally Bear Rinehart has a Kings of Leon sounding tone to his voice. The Reckoning is one of the many examples on this album where a great rock voice is required to be able to sing these big catchy rock choruses. Able is another one of the tracks that jumps out at you because it just doesn't quite fit on the album, yet at the same time it fits in perfectly. It has a more soulful sound to it with clever piano chords. One of the standout tracks of the album is A Place Only You Can Go, starting off with a very simple acoustic guitar with that folk Mumford feel to it again, but for me the song is so moving and touching because of the honest lyrics. The band sing "Pain is alive in a broken heart, The past never does go away... Grace, she comes with a heavy load, Memories, they can't be erased like a pill I swallow, he makes me well, and leaves an awful taste. Oh I know this song won't do, Enough to prove my love to you, In my heart you'll always know, There is a place only you can go". The simplicity of this song is what makes it what it is. There are many other songs on this album that I could have easily made as a standout track and many more I could have talked about. But let me suggest to you to find out more about this band. This is one album that has been on continuous play on my music players since I have had it. 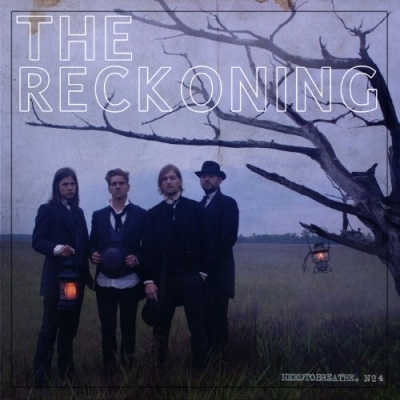 'The Reckoning' is a creative set of songs, showing the world that indie rock can be at times dark, rocky and truthfully honest, but put that with great harmonies, interesting chord structures and savvy musicianship and you get a stunning set of songs for a very sturdy album.